One is ancient geological history that is being seen for the first time. Another is living history that refuses to die. And a third is a blast from the not-so-distant past. Histories, long past and relatively recent, are the lure of these three unique sites: Kartchner Caverns, Tombstone, and the Titan Missile Museum. The beautiful desert springtime provides the perfect opportunity to visit these sites and others among southeastern Arizonas wealth of attractions. Kartchner Caverns State Park is only a year old, but the subterranean cave system that lies beneath Whetstone Mountain was created over the last 10 to 20 millions years. Kartchner's phantasmagoric formations evolved as vast limestone deposits seeped and dissolved, carving and forming an elaborate network of otherworldly formations. 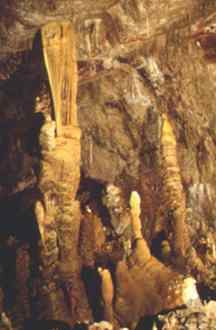 The cave offers such magical geological curiosities as long-hanging soda straws, knotted helectites, "bacon," frozen waterfall-like shields, draperies, quartz needles, and Kublai Khan, a thickly muscled 58-foot-tall column that dominates the spacious Throne Room. Kartchner Caverns is also a place to mentally wander and imagine the adrenalin-charged excitement of the discoverers, Randy Tufts and Gary Tenen, a story thats well told at the visitors center. They made their discovery in 1974 while on a cave searching expedition. A breeze from a hole in the ground, scented with bat guano, gave them hope. After enlarging the hole, Tenen slithered through. One visit led to another and each revealed new wonders. Nowhere is that sense of adventure more evident than from a trailside overlook of mud flats where Tufts and Tenen slogged their way from one section of the cave to another. Fearing others might carelessly damage its fragile formations; the explorers only shared their discovery, which they called Xanadu, with select friends. 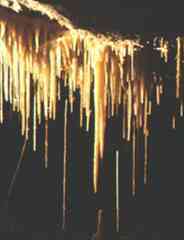 In 1978, they contacted property owners James and Lois Kartchner and revealed the cave's wonders. Secret efforts to buy 550 acres from the Kartchners for development as a state park began in 1987. "Carrot" formation Tenen, Tufts and the Kartchners wanted to create a park where environmental awareness and preservation are the primary goals, not recreation.A master plan was completed in 1991. Construction began in 1994. The underground development of trails started in 1997. The park opened in November 1999. A dazzling high-tech 22,000 square foot visitor center headlines the $28 million worth of park improvements. The complex also features a transit system that ferries visitors to and from the air-locked cave, and an elaborately engineered inner-cave walkway. "Caves are unique and nonrenewable resources," said Tufts and Tenen at the opening. "Amidst the wonder we felt when we found the cavern was a sense of responsibility to care for it. If we didn't, who would?" Tombstone is one tough town. We saw public hangings and gunfights that left bodies sprawling on downtown streets. When no one was being strung up or shot down, low-slung stagecoaches rumbled up and down the streets. And when my father and I needed some refreshment, we visited a bawdy saloon where scantily dressed barmaids served up the drinks. OK, it was all fake or, more accurately, historically reenacted. Most "western" towns have the atmosphere of overly sanitized, sterilized movie sets. Not Tombstone. Framed by the Dragoon Mountains, only an hour's drive from the Mexican border, Tombstone is the real deal. Most notoriously Tombstone is known as the hangout of the Earp brothers, Doc Holliday, the Clanton clan and other participants in the infamous 1881 Gunfight at the O.K. Corral. Legendary for its freewheeling frontier days, the town has kept its legacy alive with the help of several movies about the gunfights, including 1993's "Tombstone," which starred Kurt Russell, Val Kilmer and Bill Paxton. 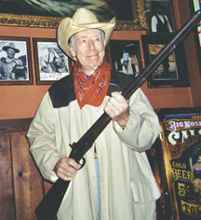 Tombstone's legacy dates back to 1877, when Ed Schieffelin announced plans to seek his fortune in Apache country. His friends said that all Schieffelin would find would be his tombstone. Instead he discovered one of the richest veins or silver and gold in the Arizona Territory. Just as he capitalized on his good fortune, Schieffelin capitalized on his friends bleak predictions by naming his first claim "Tombstone." When his mining camp became a boomtown, the settlement adopted Schieffelin's name. Tombstone quickly became notorious as a town seeping in lawlessness, sin, and shootouts. Its heady times were relatively brief. The bonanza lasted only seven years, when underground flooding closed the silver mines. But the town persisted, earning its moniker as "The Town Too Tough to Die." 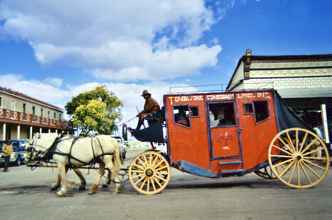 Tombstone remains a living history museum, one that's easily enjoyed by strolling its downtown boardwalks as stagecoaches rumble alongside. The historic Bird Cage Theater, once a hangout for whores, gamblers, drinkers, brawlers and an eclectic array of performers, looks tired and aged. The cowboys, gamblers and outlaws who prowl downtown, especially on weekends and holidays, aren't the rhinestone variety. The reality of Tombstone's hard life is evidenced at the Boot Hill Graveyard, where many of the 250 graves are marked "Unknown." Not many of those buried here died from natural causes. Rather, they were killed in shootouts, stoned to death by Apaches, shot by drinking partners, ambushed by robbers, thrown from horses, poisoned by strychnine or fouled water, or hanged for their crimes. Tombstone gunslinger The living history that so pleases todays visitors is staged by the Tombstone Vigilantes, a group dedicated to preserving the town's Old West atmosphere. They reenact the famous battles held at the O.K. Corral, Six-Gun City, and the Helldorado Amphitheater. "Vigilantes" prowl the streets, hijacking tourists and looping nooses around their necks. "Ladies" frequent saloons like Big Nose Kate's, the Crystal Palace, and Johnny Ringo's Bar. The town's past is preserved at the Tombstone Courthouse State Historic Park, Bird Cage Theater Museum, O.K. Corral, Camillus Fly Studio, and Tombstone Historama. Other offerings include the Cowboy Museum and the wonderful Rose Tree Museum, home of the world's largest rose tree that covers 8,600 square feet. Not so many years ago the world was poised on the brink of self-destruction. Between 1963 and 1987, 54 sites in the United States were equipped with Inter-Continental Ballistic Missiles (ICBM). Each was loaded with a nuclear warhead and on alert 24 hours a day in case of an attack by the former Soviet Union. Snug in protected underground silos, they could have been launched with only a minute's notice. Happily, those orders never came. The sites, which took 18 months each to build with a cost of $8.3 million for each complex and another $2 million for each missile, were finally phased out by mid-1987. All but one site and missile were dismantled and destroyed or retrofitted to launch weather and communications satellites. One, located about 25 miles south of Tucson, was transformed into a museum as a reminder of what could have been. Complex 571-7, now the Titan Missile Museum, offers a fascinating but chilling glance at a Dr. Strangelove reality. Guided tours provide a look at the aboveground exhibits and, most engrossing of all, a visit inside the silo. Picture windows in the launch duct wall show mannequins in rocket fuel handler's outfits performing maintenance on the missile's stage 2 oxidizer tank. More impressive are viewpoints that give a sense of the missile's imposing size, and the very dated operations desk, which looks like a set borrowed from the original Star Trek television series. 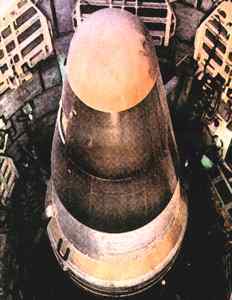 The Titan Missile Museum has been a public fascination since 1987. Combined with the geologic mysteries of Kartchner Caverns and the romanticized remembrances of gunslinger days at Tombstone, the trio of sites makes for an unforgettable trip to southeastern Arizona in springtime. Click here to plan your own trip to southeastern Arizona.